Many of Australia’s Leading companies employ the services of these organisations to ensure contractors working for these companies are fully compliant with WHS and other best practice policies and procedures. Companies Like Stockland Development, Federation Centres, Optus, AGL and Lend Lease etc require these as mandatory certifications. 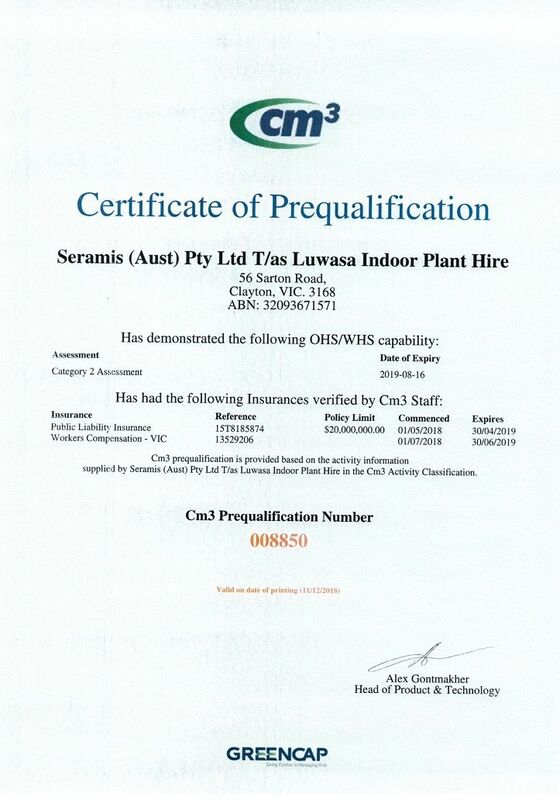 When you choose Luwasa Indoor Plant Hire, you can be confident that you are employing the services of a fully accredited company working to current WHS/OHS legislation to achieve a safe work site and safe work method protecting your business and ours.We have all insurances and other compliance requirements in place to ensure your protection. You can be confident when using Luwasa Indoor Plant Hire you are in safe hands. Click here to download a copy of our Cm3 Certificate.